Putting his stamp on Canada's largest and most visible local church, Pope Benedict yesterday named Archbishop Thomas Collins of Edmonton as archbishop of Toronto. It's a homecoming for the Ontario native, who turns 60 next month and becomes the tenth archbishop of the nation's sprawling hub of media and commerce. Collins succeeds Cardinal Aloysius Ambrozic, who reached the mandatory retirement age of 75 almost two years ago. With a reputation for quiet kindness and an earthy holiness -- he's been called "the gentlest man on the planet" -- the Rome-trained theologian and scripturalist with a background in priestly formation, a Master's in English and an affinity for John Henry Newman was a dark-horse in the conversations leading up to yesterday's announcement. Once the news broke, it didn't take long for the rejoicing to light up phone lines and inboxes in Canadian church circles. In a thinly-veiled jab at the perceived frontrunner, Archbishop Terence Prendergast of Halifax, one elated northern hierarch chimed in that Benedict XVI "chose the man of prayer over the man of politics"; a Jesuit and former Toronto auxiliary, Prendergast was in the news earlier this week after a gay couple who had civilly married in Canada were prohibited from receiving the Eucharist at his directive, and the couple announced their departure from the church. Even in his own province, the appointee's understated style has often been overshadowed by his outspoken suffragan, Bishop Frederick Henry of Calgary, a darling of conservative church activists. Last Monday, however, it was the leader of Edmonton's 340,000 Catholics who received word of his appointment to head the 1.6 million-member flock of Anglophone Canada's lone cardinalatial see. "I'm kind of in a daze," Collins told me hours after the announcement as, holed up at his desk in Edmonton, he got his first taste of the profile that comes with his new charge. It was still early in Alberta, but Toronto's archbishop-elect said he'd already had "quite a day." By turns playful and pensive, Collins was consistent in his almost-overwhelmed surprise at the move, and in displaying the positive, open tone Benedict's choices have almost unilaterally manifested to date. While acknowledging that Canadian society "is heading in directions which are often against the Gospel," the prelate said the church there must "be sure that we connect with the society we're in... not doing that in a way of condemning, but of inviting." "We've got to make the light shine and reach out. We've got to build bridges to people," Collins said, citing GK Chesterton and Archbishop Fulton Sheen as "heroes" in the effort. "We've got to be engaged." Recently invited to preach retreats for two regional groupings of the United States Conference of Catholic Bishops, Collins has made one-on-one contact a priority of his ministry over ten years as a bishop in the west. Named to Edmonton in 1999 after two years in St Paul, Alberta, he'd tell parishioners that if they wanted to talk, "just give me a call," giving out his phone number from the pulpit, but with a warning: "If you don't get the digits right, you'll get a pizza place." An easterner by birth who only went west on his appointment as a bishop in 1997, Collins says he isn't daunted at returning to his home province, as "the church is the same everywhere you go." While Canada's cultural and geographic divides each provide a unique "flavor," "the issues of individualism and living with a secular society, reaching out to young people, and trying to encourage people to participate in the church, encouraging people for vocations" remain largely the same, he said. As the intimacy of his current setting gives way to the MTA's vast diversity and scope, however, he admitted that keeping up a similar outreach amid the multiplied responsibilities of the new archbishopric would be more difficult. It's not the only sacrifice of his new reality; Collins' two sisters, who still live in his hometown of Guelph and spend their Christmases with him, are flying west on Tuesday. While he was looking to greet them, they'll be arriving as heads to Toronto for his first visit since the appointment and two days of transition meetings. "We're going to pass each other somewhere over Manitoba or Saskatchewan," he said, joking that he would "wave out the [plane] window as theirs goes by." When the archbishop met with Pope Benedict on his ad limina visit in late October, he said he just "babbled on about the diocese," and was taken aback on hearing yesterday that the pontiff was likely auditioning him for Toronto. 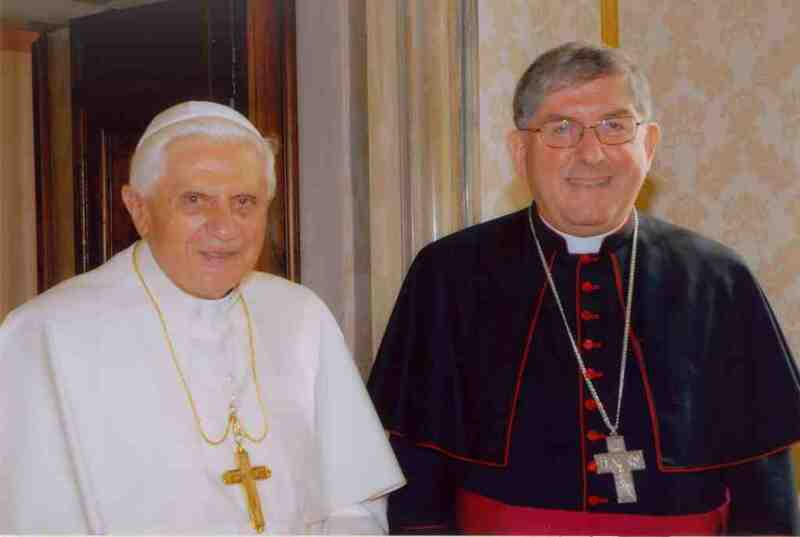 Benedict delayed action on the appointment until he could spend some time with Collins, who was part of the final group of prelates on the Canadians' quinquennial pilgrimage to the Vatican. The Pope is believed to have had his eye on his eventual choice after the archbishop's interventions at last year's Synod of Bishops on the Eucharist. While, in their private meeting, the Pope probably noticed Collins' bookishness -- the latter confessed to a "coffee table... stacked with books: history, biographies, poetry, a lot of stuff" -- one thing that didn't come up in the session was their shared affinity for cats. At the suggestion of his sisters, shortly after arriving in Edmonton he got himself a "furry little fellow with furry feet," which he didn't name at first. "I thought if I called it 'Rex,' I might give it an identity crisis," he said. "I thought if I called it 'Gandalf,' that'd be kind of pretentious." He eventually settled on Frodo. And the cat's coming with him. Though it must take place within two months of yesterday, Collins' installation date is yet to be determined.